For the Weekly Photo Challenge of Beyond I wanted to select an image that captured the essence of beyond in as many different aspects as possible. 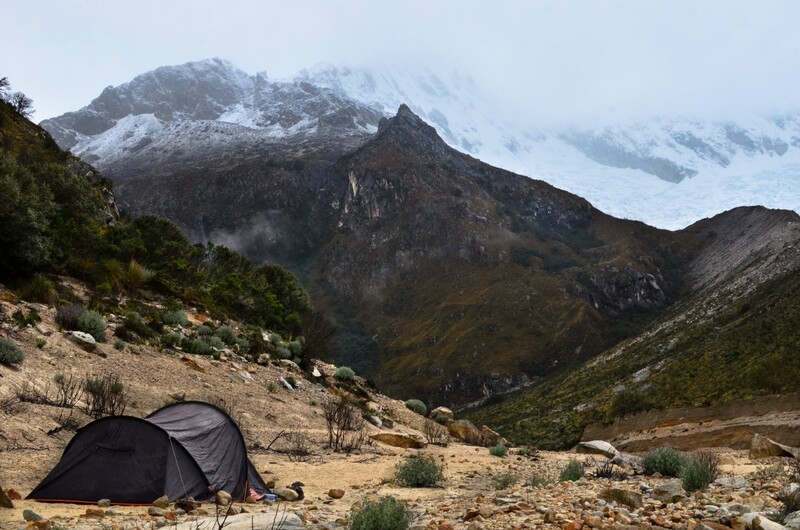 This brought me back to an incredible hiking excursion in the Cordillera Huayhuash range in Peru. When we were there, it was rainy season; we knew we were taking a big gamble by going on the trek, but we really had no other choice. After convincing the girls with the promise of breathtaking views, camping in truly unique wilderness, and waking up to stunning mountain peaks, we boldly set forth. The trip itself was taxing. Armed with camping gear, supplies, and lots of ambition, we decided to hike from the entrance to the national park instead of paying a little extra to get a ride up through the canyon. At the end of said canyon exists a magnificently isolated lake at the foot of retreating glaciers. All in all, we wound up hiking about 10 kilometers for 8 hours, up steep canyon terrain amongst the gigantic mountain peaks that towered over us. The relief was about 900 meters but felt more taxing due the elevation. We were approaching 4200 meters and felt it with every breath. Short cuts were used that turned taking the longer, windy road into near vertical jaunts that left us breathless every time. By the time we found the campsite it was getting very dark and freezing rain had soaked through our clothes and into our broken bodies. After a frustrating hour setting up the tent with frozen fingers and soaking wet everything, we climbed in and shivered the night away without food due of the torrents of cold rain coming down from the sky. We all felt sick, exhausted, and a little worried about how the night would play out. When morning came we were greeted with a sight that was truly too beautiful to describe. The clouds that had shrouded the tops of the mountains the night before had vanished and revealed peaks surrounded by a blueish-white blanket of snow. I walked around, enjoyed the silence of it all, and snapped away. The severity of our tumultuous situation the night before disappeared like the clouds, and we found ourselves beyond the boundaries of our personal comforts. Photographically, beyond the creature comforts of our tent that protects us from the elements exists the majestic stature of nature. There are so many details in this picture past the foreground and into the rich textures of the geology, the trees, the snow, and the peaks just barely visible. Beyond the known lies the unknown, and only those that go there can truly see what it has to give.